Rather than go through the submitting process again, I decided it was time to be confident about my book and self-publish it. I felt Visions was ready, but I hired an editor first who worked her magic and knocked 10k off the word count! I finally self-published Visions of Zarua 3 years ago on 16th November 2015. On 3rd January 2018, I received an email asking if I owned the rights and if I’d be interested in having a Czech translation of Visions of Zarua. I was sceptical receiving such a request out of the blue. I asked a few questions and did some research before I finally allowed myself to believe it was genuine. I sent them the manuscript as requested and heard no more. I chased it a week later, to ensure my email had been received and was told the chief editor was reviewing the book and I should have an answer the following week. Then followed a difficult few days of waiting. I remember walking back from taking my daughter to school one morning and checking my emails on my phone. There was the offer email! I must have looked crazy walking along with a huge grin on my face and I think I went into shock because I was shaking. It felt like a dream, which swiftly turned into a bit of a nightmare. Without an agent I had to negotiate the contract myself. There’s the time difference between the UK and Prague, language barriers and the fact that everyone is so busy in the publishing industry that it can take days for the relevant department to respond. There were hopes to use my original book cover, which also held up the contract signing. It turned out the image rights could only be held by one party so eventually it was agreed the publisher would provide their own cover. Four months after the initial enquiry, we were able to complete the paperwork. The day I received my signed contract by recorded delivery was amazing. Then followed another wait to receive my royalty payment. Seeing it in the bank made it all real and was the final proof I needed to know everything was going ahead. Now I have a long wait for Fall 2019 when Visions of Zarua’s Czech edition is due out. It will be part of the publisher’s new edition – World Contemporary Fantasy for young and adult readers. The last I heard Visions was with a translator. Now the book fairs etc have calmed, I hope for an update soon and can’t wait to see the cover they choose. I have loved self-publishing and being in charge of all the decisions and not having to wait on others, but it does feel kind of wonderful to know that someone out there believes in my book enough to invest time, money and resources into translating it. Another bonus – next year I will finally get my holiday in Prague. I can’t wait to take a selfie with my book in an actual bookshop! As you can see Visions of Zarua has taken an odd route into traditional publishing. I’m so grateful to the publisher Albatros Media and its imprint Fragment for taking a chance on my book. I feel more confident about the future of Visions of Zarua. Who knows what new and exciting adventures are ahead! Visions of Zarua is only 99p for a limited time to celebrate the book birthday. Suzanne lives in Middlesex, England with her hugely encouraging husband and two children. She wrote her first novel at the age of twelve. She discovered the fantasy genre in her late teens and has never looked back. 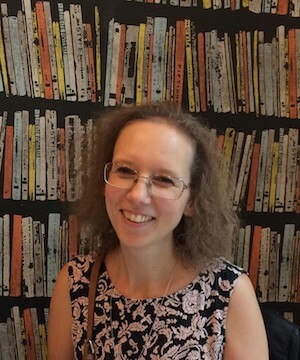 Giving up work to raise a family gave her the impetus to take her attempts at novel writing beyond the first draft, and she is lucky enough to have a husband who supports her dream – even if he does occasionally hint that she might think about getting a proper job one day. Suzanne loves gardening and has a Hebe (shrub) fetish. She enjoys cooking with ingredients from the garden, and regularly feeds unsuspecting guests vegetable-based cakes. She collects books, loves going for walks and picnics with the children and sharing with them her love of nature and photography. 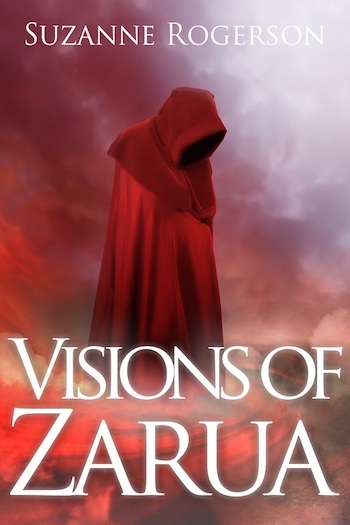 Thank you for featuring Visions of Zarua again, Cathy. It was great to put my experience down on paper and share it with your readers. Oh and as an update, I’ve seen the Czech book cover and it’s perfect! You’re very welcome, Suzanne and many congratulations. What a lovely cover! Happy bday to Visions of Zarua! Thank you. I’ve always loved this cover, though the Czech one is going to be very special too!